An Indian tribe which worships its remote jungle mountain as a living god has inflicted a humiliating defeat on one of Britain’s wealthiest billionaires over his plans to open a vast aluminium ore mine on their land. Anil Agarwal, who rose from humble beginnings as a scrap metal dealer in one of India’s poorest states to a life of luxury in London’s Mayfair, had planned to boost his fortune by mining and processing bauxite in Niyamgiri, Orissa, south East India. He promised to bring new jobs, build schools and hospitals to bring the hill’s ‘backward’ Dongria Kondh tribesmen into the modern world. His plan however, which was agreed with the Orissa state government as far back as 2005, infuriated the Dongria who saw the proposal as an attack not only on their way of life but also on ‘Niyamraja‘, the sacred hill they worshipped as their provider. They launched a protest movement to save their verdant tropical forest paradise populated by tigers, leopards and elephants from Mr Agarwal’s plans to replace its mango and sal trees with mine shafts and busy roads. And this week they clinched a decisive victory. Lakhapadar, the largest of twelve Dongria villages on Niyamgiri, rejected the mine plan unanimously in a vote described by an Indian minister as a historic moment in the country’s democracy – the first time the government had allowed its tribal people to decide their own future. The Dongria speak Kui, a language few outsiders understand, and live in remote mud hut villages with little contact with the outside world. They live without electricity, have no access to television, and have survived without schools and hospitals. Few, if any, of them have ever been to the nearest town, Bhawanipatna, two hours away by car or watched a Bollywood film. Their men, who keep sharp forest axes hooked over their shoulders and wear clips and combs in their centre-parted, pony-tailed hair, collect bananas, mangoes, oranges and medicinal plants from the forest and barter some of their bounty for salt, cloth and other items they cannot find. Dongria women have three nose rings and wear few clothes except for a backless sari cloth which loosely covers their breasts. The conflict between their old world and the new one of Mr Agarwal first emerged after the tycoon’s Vedanta Resources began building a vast aluminium refinery at the foot of Niyamgiri to process the bauxite he was confident he would be allowed to mine below its higher slopes. Many Dongria were forced to leave their homes and their traditional subsistence living to make way for the construction. Their eviction led to a series of legal challenges to halt the mining plans which culminated with a Supreme Court order for the villagers themselves to decide on the £1 billion mine investment in a series of votes. On Wednesday, several hundred Dongria gathered for the tenth and largest of 12 village council elections in what the government regarded as the decisive vote. The Telegraph travelled with judge Sarat Chandra Mishra, appointed to record their decision, as he made his way under the thick forest canopy on the two hour steep hike to Lakhapadar. The judge was accompanied by several hundred heavily armed paramilitary police to protect him after the government alleged the area had become ‘infested’ by Maoist insurgents. The tribesmen say the claim is false and the government has used it to justify a campaign of intimidation against them. Under a makeshift pagoda in Lakhapadar and amid driving monsoon rain, many villagers wielding their axes and squatting on their haunches were called out one by one by the judge to record their vote and make a speech. Their angry rejections were broadcast across the hills over a generator-powered public address system. 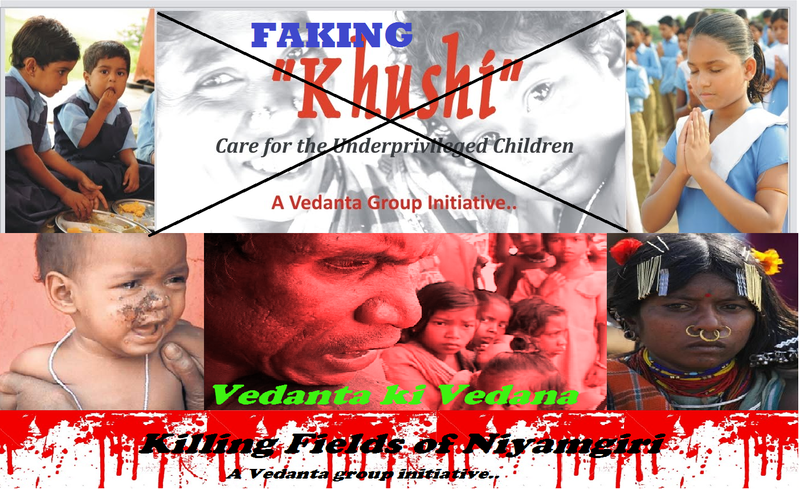 It quickly became clear no one was prepared to support the state government and Vedanta‘s vision of progress and many vowed to attack any officials or company staff who tried to exploit their hill with their weapons. Sikaka Kunji, a 50 year old grandmother with nose-rings and a white backless sari, sent fellow villagers scurrying as she started swinging an axe in the air to express her anger. “I will sacrifice my life, I will use my axe and cut whoever comes for mining,” she said. The state government, which supports the mining plan, had deployed armed police on the hill to intimidate her villagers, she claimed. “They are using the police force and disturbing us in our homes. We don’t want them and we are telling the government and the company we will cut them with our axes. Niyamraja is our god,” she added. Accounts of intimidation of villagers appeared to be corroborated when the Telegraph’s reporter and photographer were detained by police intelligence officers and a local campaigner was summoned to the their headquarters in Bhawanipatna for questioning and denounced as a ‘foreign agent’ for assisting this paper. But other villagers confirmed that intimidation by police was now a way of life. Mr Sani said he rejected the advance of development and expressed the hope that his eight year old son Dili will never go to school, watch television or play computer games. But he conceded that despite the famous victory of his small village over a mining giant, the march of development was probably unstoppable. “Once he is educated, he will leave this mountain and learn this lifestyle. He will sell our land to the company. At these schools, they don’t teach how to live with nature, they teach how to live by exploitation,” he said.